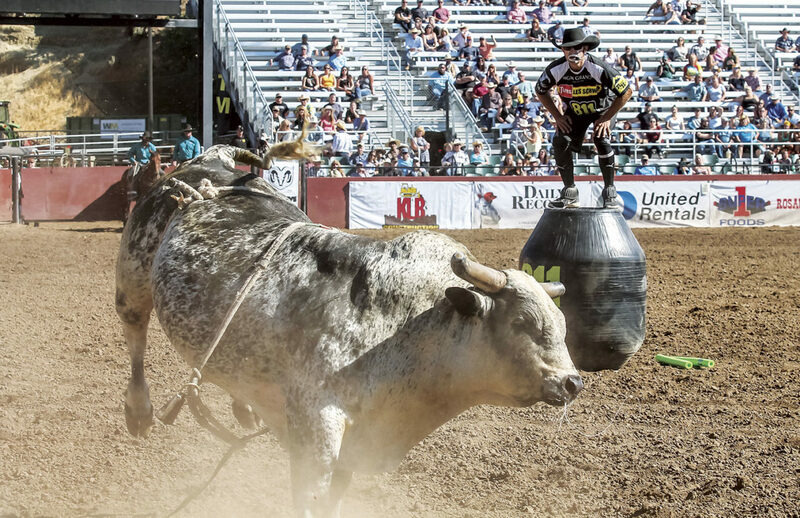 Professional rodeo clown JJ Harrison ’98 is one courageous guy. When not defusing Brahma bulls in the arena, he’s disarming preteen bullies in the classroom. It’s not the role he envisioned for himself while earning his degree in elementary education at Washington State University, but one he seems uniquely born to play. He made the transition to full-time clowning in 2008 and has since performed at rodeos in Florida, Hawaii, and everywhere in between. As one of the nation’s top rodeo clowns, Harrison’s act is booked nearly year-round. Not only does he entertain the audience during lulls in the program, he also protects injured cowboys during bull riding and other events. It’s his job to distract the bull while the fallen contestant limps out of the arena. His athletic high-energy antics have made him a five-time nominee for the Professional Rodeo Cowboys Association (PRCA) Clown of the Year award, which is presented at the National Finals Rodeo in Las Vegas. Harrison, who says he doesn’t drink but loves to party, also hosts the MGM Grand Gold Buckle Zone show during National Finals, where he often brings cowboy superstars on stage to meet and interact with the audience. Harrison says his act is mostly impromptu, off the cuff, and an extension of his goofy personality. It includes things like riding horses, throwing footballs to the crowd, and showing off impressive dance moves while wearing giant inflatable air suits. Harrison carries that positive energy into every community he visits. From rodeo skits honoring police officers and first responders to promotion of 811 farm and ranch safety, he uses his time on stage not just for a laugh but to uplift and inspire. That includes taking his Don’t be a Bull-y! Be a Champion! campaign to school assemblies around the country. The lighthearted but serious program teaches the difference between simple teasing and bullying.